Not surprisingly, the proposed complex has also become an easy target for one of Ottawa’s favourite games of second guessing that exposes the inferiority complex hobbling far too much of what entrepreneurs and their supporters are trying to accomplish here. When the Communitech Hub opened in 2010, it did so as part of a large-scale redevelopment project of the Tannery Building that houses it as well as tech giants such as Google and Desire 2 Learn. The Tannery Building, in turn, was only one element of an ambitious downtown revitalization plan for Kitchener that has seen the University of Waterloo relocate its School of Nursing to the neighbourhood along with countless new condo and retail developments and a soon-to-be-completed transportation hub. Kitchener’s downtown still has its dodgy bits, to be sure, but it is clear that something new and exciting is afoot. I am certain that when the Communitech Hub was first proposed for its then out-of-the-way location far removed from the university classrooms and labs and from RIM’s ubiquitous low-rise buildings, it seemed like a peculiar place to put it. But the vision and faith of those behind it has been validated. I believe the same potential holds true for the city’s Bayview Yards scheme, of which the proposed innovation complex is simply one part. An important part. And, like the Communitech Hub, a potentially anchoring part. But still just one part. Don’t worry, Leo; I’m sure a decent proliferation of coffee shops will inevitably be part of the overall program. It won’t be downtown or in the Byward Market. But if the right things are included in and around it, it will become the new destination for Ottawa’s technology communities. Luc Lalande, a long-time and insightful observer of Ottawa’s technology scene, also weighed in on Invest Ottawa’s plans, both in a column on his own blog and in a comment yesterday on Leo’s post. I agree with Luc that the complex needs to be about more than just bricks and mortar, that the sorts of programming, facilities and shared tools it offers will be more critical. But I disagree that the bricks and mortar are not important. I think this city desperately needs a place where entrepreneurs, startups, mentors, advisors, investors, government programs and, yes, even the bottom-of-the-food-chain suppliers like lawyers, accountants and consultants can all come together. My bottom line is that I want somewhere in this city that acts as the focal point for all the energy, enthusiasm and effort that I see every day as I talk with entrepreneurs and startups. I want it to have all the things Luc talks about in his column. I want it to have the right mix of private office space and open public spaces. I want it to be open, vibrant, accessible and welcoming. I want everyone in the startup ecosystem to be able to drop in whenever they want, knowing that they will run into people they want to and need to meet. I can do that in Toronto, in K-W, in Montreal, in Vancouver, in London and in Cape Town. But I can’t do it in my home city, and that, above all, needs to change. If you have a point of view on this debate, we’d love to hear it here. Just as usefully, you could also turn out for the focus group that Carleton University’s Technology Innovation Management program has scheduled for next Tuesday. Come on people: Let’s put that inferiority complex to bed and dare to dream that we could build something #OttawAwesome! Great article. I hadn’t really looked into what they were trying to achieve, and after reading more on it hope that it reaches its full potential. 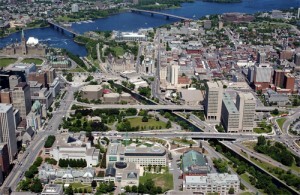 I totally agree Francis that while the Ottawa community is strong, it’s so fragmented. Would be great to have a place people could just go and be creative. Francis, thank you for sharing your views on this topic. You and Leo are prompting a thoughtful and publicly visible discourse on an important issue for the city’s future. 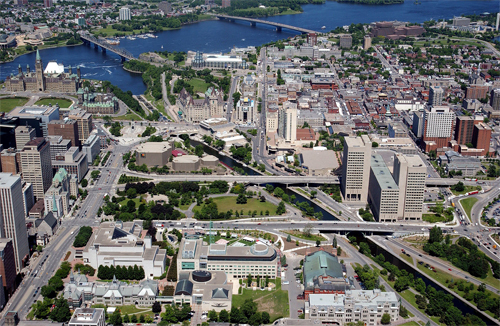 My initial opposition to the bricks-and-mortar approach stems from experience with the first attempt in Ottawa (by OCRI and The Ottawa Partnership Chair at the time) to build an iconic building meant to re-invigorate innovation in our town. At that time, the thinking was “Go big or go home” (see Ottawa Business Journal article referenced below). The price tag for a new innovation hub was anywhere between $100M-$125M with annual running costs of $10M-15M. In my opinion, you don’t build a cathedral to empower community-based innovation and startup ecosystem, you need a “bazaar”. That being said, there is truth in what Francis mentions in his post. I am warming up to the idea that an innovation hub – with the right mix of shared public spaces and private offices augmented by smart programming and access to rapid prototyping tools – can serve as a real innovation destination. The actual building need not be an iconic architectural marvel. The City of Ottawa now appears to have $15M of provincial funds to work with. Sure, this amount won’t be sufficient to build a shiny new cathedral but it most certainly can be used to create a bazaar-style space in an existing (and underutilized) property in the city. In my opinion, with the funding at hand, the issue is not merely financial. It’s the lack of imagination to come up with something creative to build a true innovation destination. For example, should the City canvass the local school boards and explore opportunities to make more effective use of underutilized schools (e.g., former Ottawa Technical High School)? The example of the Bronson Centre (a hub for resource-constrained community-based not-for-profits) at the former Immaculata High School building is an inspiration. Location does matter but unimaginative thinking about the complex will not make it an innovation destination. Thanks for weighing in, Luc. As I noted in my post, your own contributions to this debate are also well-considered. I agree we need no cathedrals. I like the idea of a “bazaar,” a central meeting place, a clubhouse (as Communitech likes to call its Hub). And while it doesn’t have to be the old city garage at Bayview Yards, there is growing momentum behind that particular initiative and, damnit, I just want to see something done. In my lifetime, if possible. Great series of articles, lots of wonderful ideas and insights. I would like to come back to “communities” that Francis used previously. A major challenge Ottawa has faced for years, or even decades, is this lack of singular community or the “me” vs “we” attitude. Project like this typically become an icon for an individual, single organization or small collection of organizations versus the community. Without a significant cultural shift in the city regardless of location or programming, success will be a long and tough journey. Many unbelievable opportunities have passed us by as a result of this culture over the lets all hope this shift is happening. A first indication of this cultural shift and a measure of potential success would be evident in the governance structure of this new hub. Is it (or will it be) a select few from IO, the City and a select few friends or will it be truly enlightened with real leaders with a shared vision and values that can make this really happen? I am hoping the latter…. I’m also really hoping for the latter, Carl. Thanks for the thoughtful article Francis. I agree with a lot what Luc has to say about the bricks and mortar as the dangers of cathedral projects. I also recognize the need for infrastructure like this, but what I would also find inspiring is if the city and the tech business community could look beyond desiring what other cities have. How could an innovation complex be driven by innovative ideas? Not a transplant of concepts developed in other cities, but innovative approaches that will trailblaze. How can we build a concept that cities like Kitchner and Montreal and so wish they had.